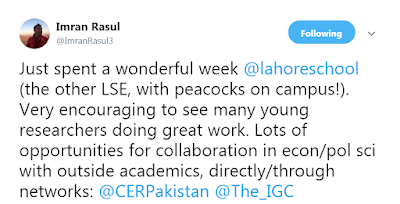 Lahore School of Economics hosted its first International Conference on Applied Development Economics on 12-13 September 2018 at the Lahore School’s Burki Campus. 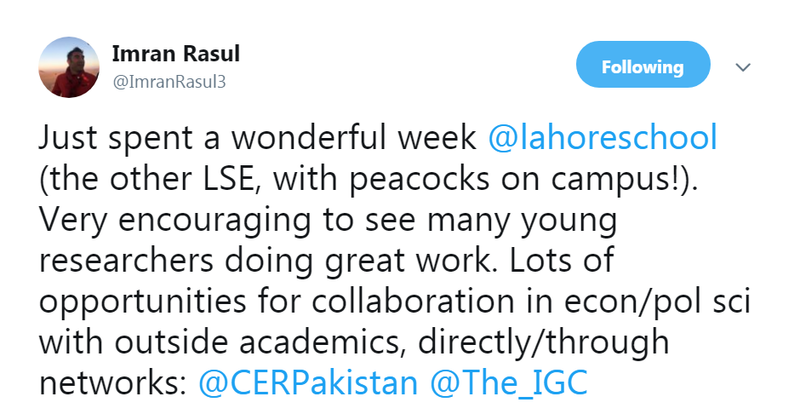 The aim of the conference was to expose researchers and policy makers in Pakistan to on-going research on key issues of relevance to economic development and poverty alleviation in Pakistan and contribute to improving research capabilities of young researchers in the country. The conference highlighted frontier research that is being conducted in Pakistan with the aim of economic development and poverty alleviation. The first day of the conference started with welcome remarks by Dr Shahid Amjad Chaudhry, rector of Lahore School of Economics. Professor Imran Rasul, Professor of Economics at the University College London delivered the Plenary Address was focused on new research on Bangladesh and Pakistan that aims to broaden the agenda on understanding how to optimally design social protection programs for the poor and whether such programs should entail providing transfers in kind or in cash. He showed that asset transfers reduced engagement in casual wage labour, increased work in capital-intensive sectors as well as labour supply hours. In the long run, asset transfers increased the likelihood of households to own land. Once poor households graduated from poverty they were able to borrow and lend more, suggesting the birth of a credit market. The rest of the day progressed with sessions on (i) microfinance and enterprise, chaired by Professor Imran Rasul (University College London), (ii) political economy, chaired by Dr. Azam Chaudhry (Lahore School of Economics) and (iii) gender, chaired by Fauzia Viqar (Punjab Commission for the Status of Women; PCSW). Papers in the first session (by Farah Said, Lahore School of Economics and Muhammad Meki, University of Oxford) focused on investigating demand for innovate microfinance products with hard and soft commitment devices and provided promising evidence for the potential of shared-ownership microfinance contracts to help stimulate investment among growth-oriented microenterprise owners. In the second session, Saad Gulzar (Stanford University) focused on electoral quotas as complimentary institutions to anti-poverty development programs and showed that quotas yield significant benefits to targeted minorities, improve overall program implementation while groups that are relatively privileged do worse, contrary to the expectations of affirmative action skeptics. Luke Sonnet (University of California, Los Angeles) presented results of a field experiment conducted with members of a provincial assembly to improve political communication between constituents and their incumbent legislators. Papers in the third session on gender focused on the impact of (i) easing credit constraints for aspiring female entrepreneurs, (ii) institutional reforms on de facto women’s rights and (iii) gender gap in the returns to tertiary education in Punjab, Pakistan. Speakers in this session included Mahreen Mahmud (University of Oxford), Katherine Vyborny (Duke University) and Zunia Saif Tirmazee (Lahore School of Economics). All the papers received valuable comments from the discussants that included Hadia Majid (LUMS) and Ayesha Ali (LUMS). The day 2 of the conference progressed with the sessions on Firm Capabilities which was chaired by Johannes Boehm (Paris Institute of Political Sciences). In this session Ali Choudhary (State Bank of Pakistan) addressed the issue, "why do banks not lend in rural areas?" The findings suggest that banks suffer from an inability to enforce contractual terms rather than an inability to select good borrowers. Maryiam Haroon (Lahore School of Economics), using unique firm level panel data, empirically investigated the effect of various sources of agglomeration externalities (localization, urbanization and competition) on firm level productivity, costs and prices . Her finding suggest that agglomeration externalities operate through competition in reducing labor and raw material costs and not through specialization. Johannes Boehm (Paris Institute of Political Sciences) presented his work in which using microdata on Indian manufacturing plants, he shows that production and sourcing decisions appear systematically distorted in states with weaker enforcement. The second session of the day State Capacity and Local Institutions chaired by Theresa Thompson Chaudhry (Lahore School of Economics) started with the presentation of Hamna Ahmed (Lahore School of Economics). The objective of her study is to understand how the donor responds to new information on performance of local community organizations on Key Performance Indicators (KPIs). She presented the results that show how the donor’s response relates to organizational characteristics of theoretical importance, including divergence of preferences between members of the organization; communication costs between parts of the organization; and decentralization of decision-making authority. Haseeb Ashraf (University of Warwick) showed his work in which he evaluate the impact of scarcity on inter-village cooperation in Pakistan by using detailed administrative data on water discharge to quantify water theft along a distributary that serves as a measure of inter-village cooperation in the management of surface water for irrigation. The third session of the day Political Economy II chaired by Waqar Wadho (Lahore School of Economics) started off with the presentation of Muhammad Yasir Khan (UC Berkeley). In his study he run a randomized control trial prior to elections for village councils in rural Pakistan to study three barriers to political entry: cost of running for office, lack of information on electability of candidates and lack of information on benefits from office. The last session of day as well as of the conference titled Poverty and Behavioural Constraints was chaired by Anjum Nasim (GC, IDEAS) and was started with the presentation of Rachel Cassidy (Institute for Fiscal Studies). Her study estimates that many poor individuals are “present-biased" may be exaggerated if credit-constrained individuals are expecting to have greater liquidity in the future. She conducted an experiment in rural Pakistan to provide causal evidence of this effect, using windfalls to generate fully exogenous variation in subjects' liquidity constraints. Jacopo Bonan (Politecnico di Milano and Fondazione Eni Enrico Mattei), Started his presentation by explaining that almost 70 million people in Pakistan (35% of the population) do not have access to electricity, as they live in areas, mostly rural,not reached by the grid. His study investigates the role of soft behavioural prompts aiming at stimulating the formulation of intentions and mental plans of action in a novel setting as low-cost solutions to lower default rates. The last presented of the session, Faiz Ur Rehman (Quaid-i-Azam University) showed that in the backdrop of rising food insecurity, hunger and malnutrition in Pakistan, this study aims to measure the effects of indirect taxation on health outcomes of children less than five years. The findings suggest that the exemption of certain food items for children from the GST may not eliminate the negative effects of this tax on a child’s health. All the presentations were well received and were followed by the valuable comments from the discussants. Overall the conference created a great opportunity to stimulate the research and policy debate in the key areas of Economics.